It’s that time of year where I get a little bit older, 23 this time. So to celebrate I have decided to share one of my family’s favorite sweet treats with you. This is the one – the ultimate celebration pudding we whip up for all manner of occasions- Birthdays, Christmas or just a get together. 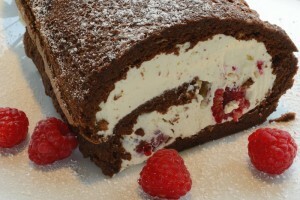 Chocolate roulade is a beautiful thing. It’s light, creamy and packed full of flavor. You can fill it with whatever you want, my favorite is fresh raspberry but it goes equally well with cherries, strawberries and pretty much any other fruit or jam you can think of. Careful with the jam though – use it sparingly as you don’t want it to be too sweet. This pudding is a legend. Happy Birthday, Happy eating! I am sitting here enjoying one of my favourite soups and i thought i’d share it with you. Vichyssoise isn’t just difficult to spell, i have tried a million times to get it right, still can’t. It’s a divinely smooth, delicate and sophisticated leek soup served chilled. It’s perfect eating to accompany a lazy weekend dinner or lunch in the sun. It’s also a great dinner party dish because you can prepare it, quite easily, a day in advance and just ladle it into bowls and top at the last minute. I have added a few special extras to the soup which take very little preparation but make a huge difference. 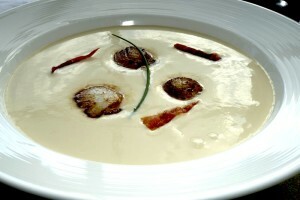 The warm scallops cut through the chilled soup and take it to another level. The crisp pancetta shards are like little flavour explosions of piggy pleasure. If you are feeling extra fancy add drizzle of truffle oil or keep it simple and add a few snipped chives. Whether you are giving yourself a treat or impressing guests relax and enjoy this great soup! Spain is one of my favourite places to go on holiday, one of the main reasons being the food. It is incredible! Tapas is a way i love to eat, lots of little beautiful tastes and variety of textures. Basically i’m greedy pig who likes to try lots of things at once! 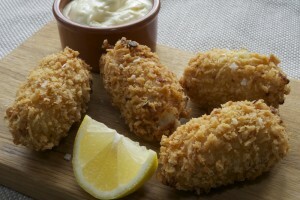 Don’t get me wrong i’m also happy to share so why not try these ham and cheese croquettes! I have been meaning to make them for years, since first trying them when i was about 8. Imagine a crispy crunchy coating surrounding a soft, creamy filling speckled with beautiful cured ham. Serve it up with some aioli, other tapas bits and lots of sangria! Yorkshire, God’s Own County, The White Rose- whatever you want to call it we can all agree it’s a great place to be! 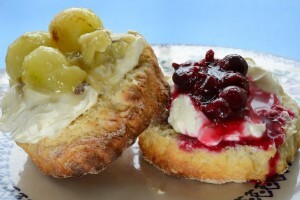 To celebrate Yorkshire Day i thought i’d feature a beautiful Yorkshire Cream Tea which includes homegrown blackcurrants and gooseberries as jams. There is something especially sophisticated and celebratory about a cream tea, so get your friends, family and neighbours round and celebrate Yorkshire Day wherever you are in the World.